Aromas in Wine is a fascinating topic to explore. Why does oaked Chardonnay have a scent reminiscent of butter? In this video Annabelle goes full geek to discover where wine aromas come from and why the human brain can think that a drink that is made only from grapes, can suddenly find aromas of fruit and flowers in the wine glass. Join WineScribble to find out more about the basic chemistry of wine aromas. 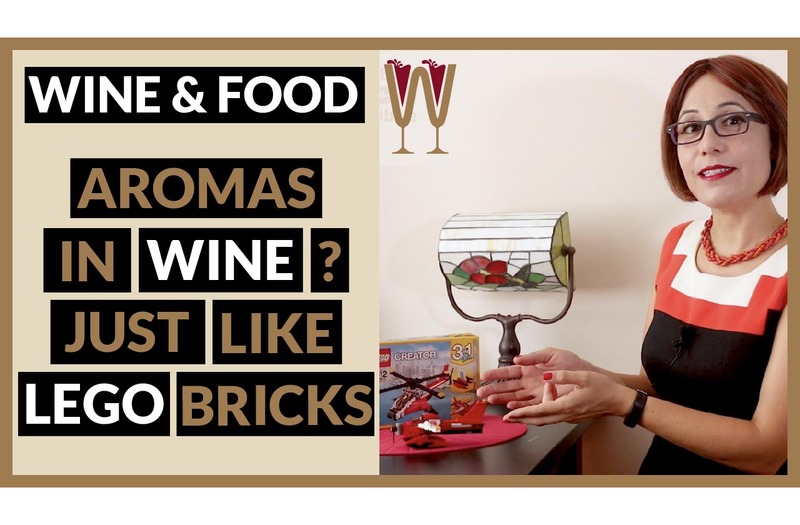 And stick around until the end for the top tip that explains how to think of wine aromas in terms of Lego bricks. This wine is made of 100% fermented grape juice, so why can I detect the aroma of apple in my glass? There are certainly no apples, apricots or citrus fruit in my wine. So, if they were never added in the first place, where do all these flavours and aromas in wine actually come from? This short video is about the reasons why we can detect aromas in what is 100% fermented grape juice, that seemingly emerged out of nowhere just to pleasantly surprise us. And stick around till the end for an explanation of how our brain impacts our perception of aromas and flavours! Hey Tasters, this is Annabelle McVine. Welcome to the WineScribble Youtube Channel, the home of “Wine Applied”. So, where do all the flavours and aromas in wine come from? The answer is: Stereoisomers. Stereoisomers are the happy side-effect of fermentation. As the yeast consumes the grape sugar in the must and converts it into alcohol, thousands of chemical compounds, known as stereoisomers, are also created. But what actually are Stereoisomers? They are isomeric molecules. No need for panic. All this means is that they have the same atoms as another molecule, but their atoms are differently arranged. It’s a little bit like using the same Lego bricks to build a different model to the one specified in the instructions. One is a helicopter, the other is an aeroplane. Although the sequence and three dimensional arrangement of Lego bricks is different, the two models are built with exactly the same bricks. The smell of Lego bricks? If you could smell those two Lego models, both would give off exactly the same scent. Our noses and brains wouldn’t really care whether the bricks had the shape of a helicopter or a plane. This is why our brains recognize and identify these chemical compounds floating about in our wine as familiar aromas they have encountered before. This is not as unusual as you might think and not solely restricted to fancy wine tasting. Have you ever wondered why you are spreading margarine on your toast but, somehow, you almost can’t believe it’s not butter? You can now thank a stereoisomer called diacetyl for the admittedly questionable pleasure that is a butter substitute. More to the point, diacetyl is the exact same stereoisomer that gives oaked Chardonnay wines their distinct and unquestionably pleasurable buttery flavour. By the way, if you want to learn more about the effect of this buttery wine scent on food pairing, check out our video showdown between an unoaked and an oaked, diacetyl-rich Chardonnay. Which one do you think I enjoyed most served with Camembert? The link to that video is in the description below. And now for my bonus tip: what has our brain got to do with wine tasting? Let me tell you a story. I grew up in Cyprus. One day I was sharing a bottle of Sauvignon Blanc with a friend that grew up in Northern Europe, and he remarked that the wine tasted like gooseberries. I had no idea what on Earth he was talking about, having never experienced the taste of gooseberries. Let alone being able to find gooseberry aromas in wine. The Sauvignon Blanc actually reminded me of walking through green fields in Cyprus as a child and chewing on the stems of lemon clover, a weed that grows abundantly here. Could it be the same stereoisomer making us smell two completely different things? Basically, yes! Our brains keep a database of scents it has previously encountered and checks any new scents it detects against this reference library. And that’s why the next time I travelled abroad, I made sure I tasted some gooseberries. We would love to hear your questions about wine. Leave them in the comments section below, send them via email or share them on our social media platforms. I can’t wait to see them! So, Tasters, If you liked this video hit the like button below. If you would like to see more of these videos share with your friends and subscribe to our YouTube Channel now. And remember, those who drink get drunk. Those who taste, feel sublime. I will see you on the next video.